Thump is a simple, highly configurable Minecraft chat multiplexer with built in IRC support. It's part of the Willow Chat organisation. The built-in IRC service uses the Warren IRC framework to send in-game messages and events (like players joining and leaving) to a configured IRC channel, and vice versa. 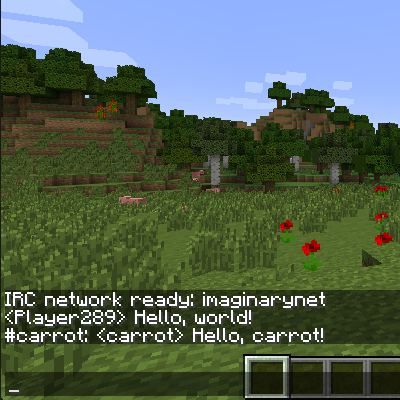 It's made for use on servers (originally to share ForgeCraft chat to IRC), but it's tested and works on clients too. Most aspects of the mod can be configured, but the defaults are good enough for easy setup and use. If you use this software and you'd like to support my open-source work, please consider tipping through Patreon.